Have you ever heard of the “Medieval Manhattan”? You will find it just 20 kilometres from Tenuta delle Rose. San Gimignano has been a Unesco World Heritage Site since 1990. And rightly so: even today, you can reach out and touch the rich past of this little town in the streets and alleyways. During the Middle Ages, the patrician families of San Gimignano would repeatedly try to outdo one another by building one tower-house after another. Some of the imposing towers remain intact today and give the town its world-famous silhouette. 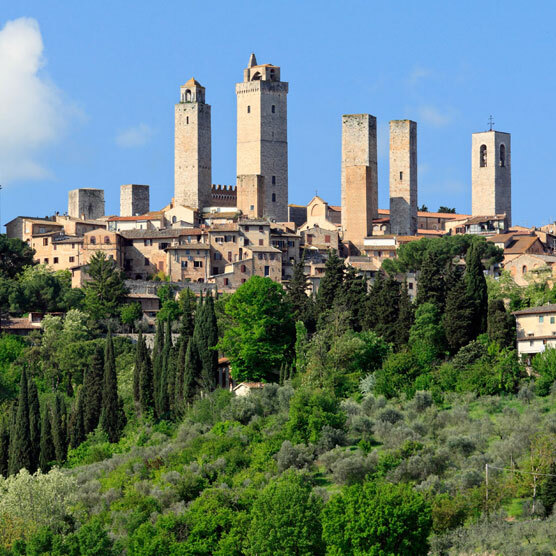 San Gimignano is also famous for its “gelato“: two ice cream parlours claim to make the best ice cream in the world. We cannot say with certainty which of them is right – so we suggest you go and decide for yourself.